Proxymizer’s lazy dudes finally released a new version. As stated previously, it reads the proxy lists much better (especially the obfuscated ones) thanks to Internet Explorer Active X control and also checks proxy validity better. One drawback: your previous preferences are lost (because of technical things and stuff). Quite a long time since we haven’t published any news. With a bunch of new features, bug fixes. Your private life (IP, country) is now private again. Proxymizer is seen as a proxy (HTTP) and connects in background to public proxy servers (HTTP or SOCKS), anonymizing originating address for all requests, from simple HTTP to any proprietary protocol, if the application supports connecting to a simple HTTP proxy. First proxy: allow user to specify a local proxy (or internet, or anything), so all proxymizer requests start through it. SOCKS and HTTP proxy server are supported by now. Configuration: many options are customizable, such as proxy anonymity choice. Possibility to avoid proxy servers in own country: for people who really want to go out of their country. Please also note that you can submit your suggestions to http://proxymizer.uservoice.com (or click on the “feedback” tab on the right). Proxymizer now owns its domain, thanks to a generous donator. 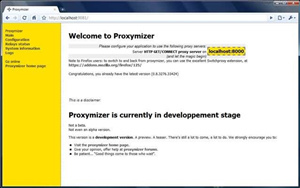 The only and official proxymizer is now at proxymizer.net, but still hosted by SourceForge. Differential configuration: when proxymizer initial configuration changes, your changes are applied back in a differential way, so you keep changes of both. Everything is here as expected, plus an auto-update system. Version 0.9 should be released in the next few days, and as the version number show, the one after this one will be an officially working product. A proxycheck page, which is more part of proxymizer application than website. It allows to check a proxy anonymity. The first post on this website is 1000 days old. Not all 1000 were spent on proxymizer (let’s say it’s probably closer to 10% of them), but this makes a while anyway. The new version should be released later this month. A new release is coming soon (now using 0% of you CPU). Stay tuned. With a few fixes and a few enhancements, a new version 0.3 is now available for download. Well, we’re probably going to use it soon, so here’s a free advertising: use Zaxas! This is a CTP (Community Technology Preview) as they call it. This means that it’s not a beta, not even an alpha version.You can download it from the download page. It is also time for us to recruit talented people (or anyone who volunteers, at this time). 2006-07-02: A first release coming soon! Right, we said the same thing two months ago. However, as alcoholics say, “this time it’s for good”. Currently, proxymizer seems to work fine enough to be released and configured (as a preview, of course… There’s still a long road to go). By searching the three pages returned by google with “proxymizer” as query, we fell on a forum where a guy had almost the same product idea (and the same name of course). You can see it at http://www.delphi-forum.de/viewtopic.php?t=5661&highlight=proxymizer. After a ReST server, we also started an ASP.NET one, following the idea that an html interface could be a better idea than an winforms one. 2006-05-06: A first release coming soon? (well, depending on what you put in “soon”). Since the proxymizer engine works as expected, there may be a first development release (still on MS.NET only :() in the form of a MSI install. Please not that it won’t even be an alpha version, but closer to as development version, or “community technical preview”. Well, at least there’s something more than a simple page. Right: three pages (wow!). The first one: you’re reading it. The second page is “what is proxymizer?”, and, well, you got the point. The third page is the project status page, a kind of cheap blog. Even if it is too early to think recruitment, we take seriously all logo proposals (as you may see: this one s*cks).